12 traditional crispy corn tortilla shells for making spicy mexican tacos. 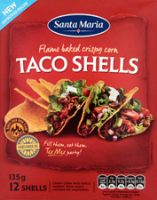 Made from 100% pure maize flour, they are delicious filled with chilli con carne or spicy refried beans. Our Price: £1.49 Sorry this item is out of stock.